Dimensions: 11 1/2" x 15 1/2"
Hope End, signifying "a closed valley," was Elizabeth Barrett's childhood home near Ledbury, Hereforeshire, England. Her bedroom and sitting room were at the very top of the house. This is a view from the lower pond. 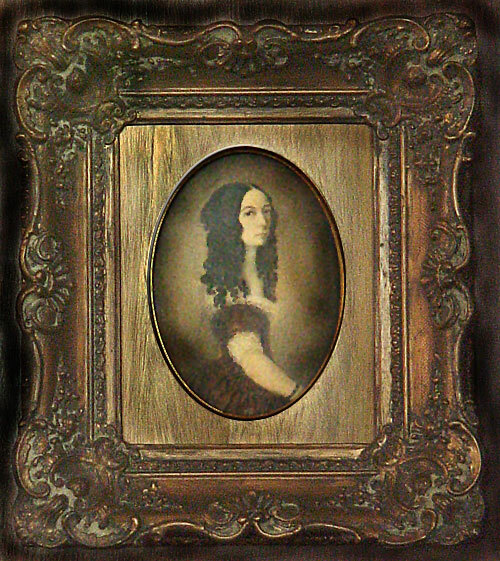 The artist also created a companion portrait of Elizabeth Barrett Browning during the same time period. This painting is described by Elizabeth Barrett Browning in a letter to her sister Arabella on January 10, . 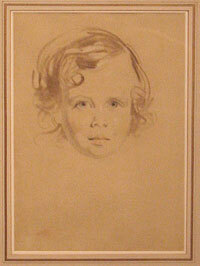 Although Pen was eight years old, his mother still enjoyed his curls and dressed him in velvet and lace. Gift of Irving Bush, Jr. Commissioned by Robert Browning for his wife Elizabeth, the bust of their son, Robert Wiedeman Barrett Browning, was modeled in 1858 for a fee of 25 guineas which was a considerable sum of money at the time. Although Pen was almost ten years old, he was still dressed in a fashion more suitable for a Victorian boy of four or five. Elizabeth wanted him raised in an androgynous manner, hence the bust's long curls and feminine mode of dress. Robert did not agree with this idea. Following Elizabeth's death in 1861, Browning had Pen's hair cut and dressed him in a young man's clothing. The bust was a gift in 1922 from the Highland Park Browning Society, Dallas, Texas. This life-sized bust was done in 1841, when John Kenyon was 57 years old; it eventually belonged to the Brownings. A distant cousin of Elizabeth Barrett and a close friend of Robert Browning, Kenyon was responsible for the two poets' meeting. Elizabeth Barrett had mentioned Browning very favorably in her poem "Lady Geraldine's Courtship." Kenyon gave a copy to Robert and encouraged him to thank her--this began a correspondence that led to their courtship and marriage. Kenyon was very close to the couple, helping them financially during his lifetime and leaving them a generous sum of money in his will. The bust was given to the Browning Collection in 1944 by the Neiman-Marcus Company of Dallas, Texas. Sarianna Browning, the poet's sister and younger sibling (1814 - 1903), never married but devoted her entire life to her father, her brother, and her nephew. Dimensions: 6' x 2' 3"
This painting hung in the Brownings' home in Florence. From the Italian school of the Correggio Period, Saint Sebastian is the patron saint of good health. Although neither the artist nor the exact date of this painting are known, the style is identified as being that of the Italian School. 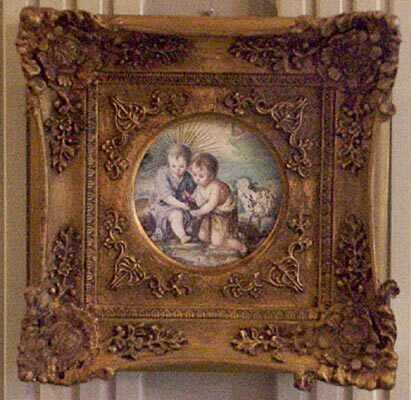 The Madonna originally belonged to the Brownings and hung in the salon in Casa Guidi. The painting was a gift from the Lambda Alpha Chapter of Sigma Tau Delta in 1953 in honor of their sponsor, Dr. A. J. Armstrong. Dimensions: each 5 1/4" x 5 7/8"
This is technically two small paintings on one wood panel. 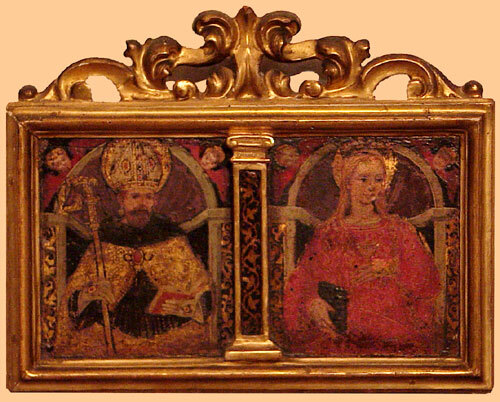 It belonged to the Brownings and hung in their home, Casa Guidi. A barely legible note by Elizabeth Barrett Browning on the reverse confirms that the artist was from the Sienese School. This miniature belonged to the Brownings and is inscribed "Murillo" on the reverse by Sarianna Browning, sister of the poet. The plaque is a bas-relief in profile of the head of Aeschylus, the Greek playwright. It originally hung in the Brownings' drawing room at Casa Guidi in Florence. The piece was acquired by the Armstrong Browning Library from Mr. and Mrs. William Sloan in 1958. 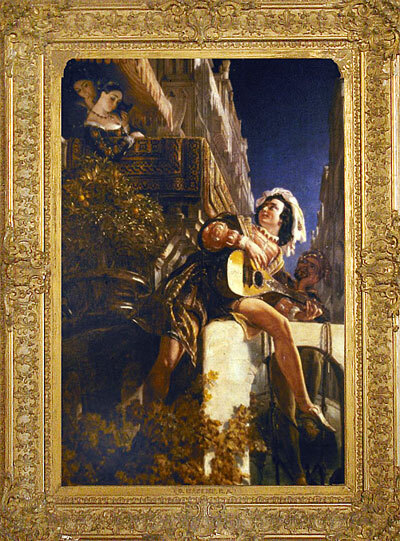 Dimensions: 52 3/4" x 37 1/4"
The painting depicts two male figures serenading a pair of young ladies on a canopied balcony, apparently in Venice. On Maclise's behalf, John Forster described the painting to Browning and asked him to write a few lines. This served as the inspiration for the first few lines of Robert Browning's poem, "In a Gondola." May light my joyous heart to thee its dwelling place. Upon seeing the painting, Browning was stimulated to add 226 more lines to the original few. The later lines tell a tale and present a situation entirely fabricated by Browning. The painting was acquired for the Library in 1950 from H. I. Jarman.